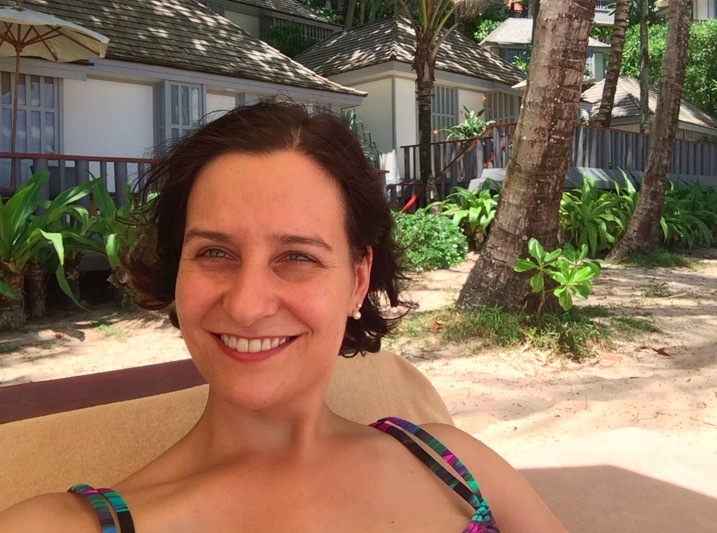 This post is long overdue… but I forgot all about it! 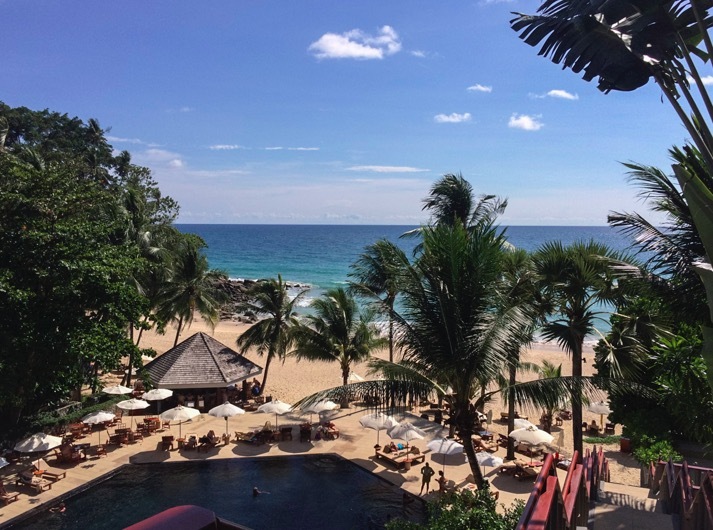 The hot and sunny August days reminded me that I still need to quickly post about our great trip to Phuket in May this year! 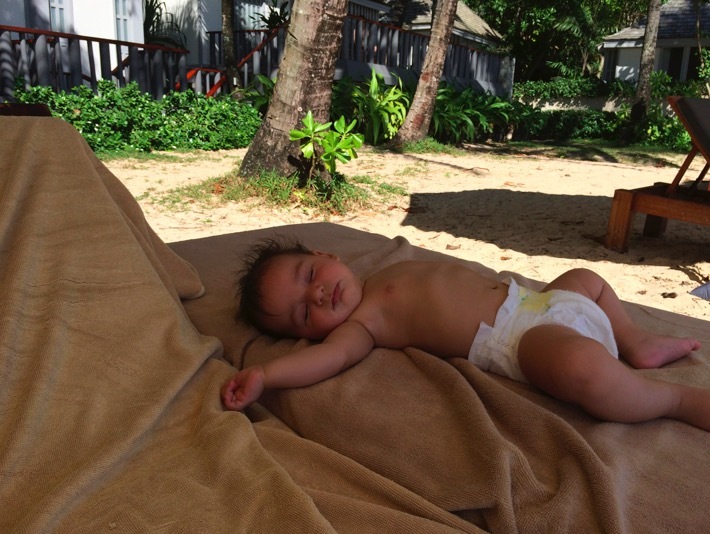 It was the first beach holiday for Lina, and our 4 month old baby enjoyed it big time. 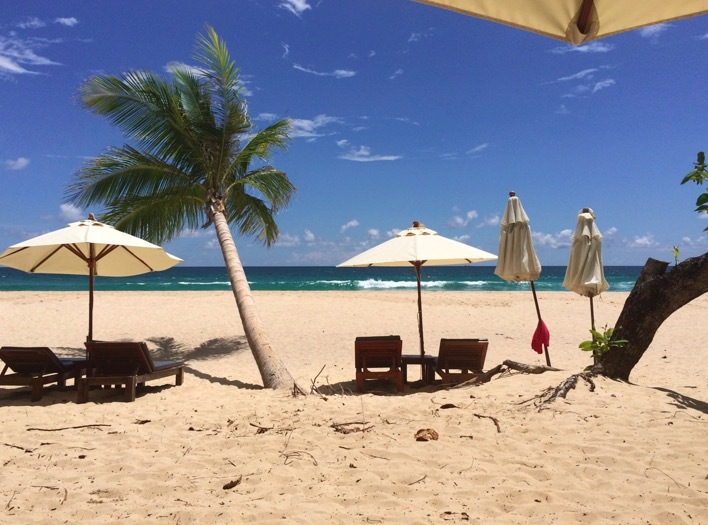 We stayed at The Surin, which is close to the airport (about a 20 min car ride) but also secluded enough (with a beautiful private beach) to just sit at the beach and relax. 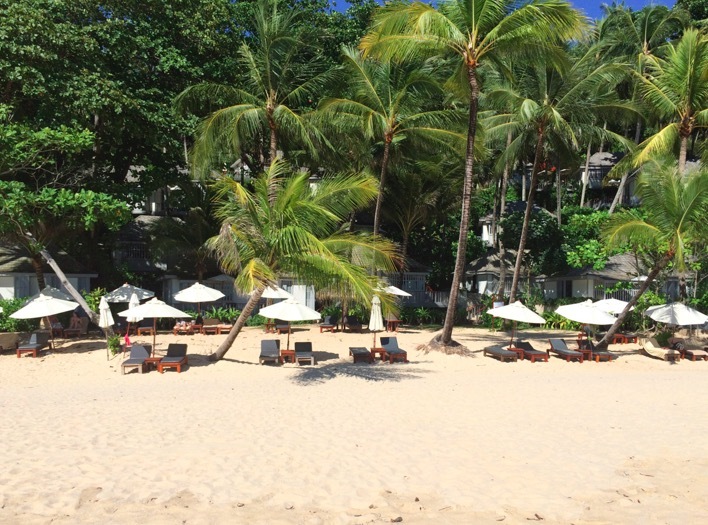 You can walk over to the main Surin beach if you want to have access to all the bars, restaurants, cafes and clubs – and we did this once, but to be honest: we preferred the quietness at The Surin. That’s what we came for – we wanted to sit at the beach, play with Lina, read books and just enjoy family time together, without having party people next to us! It was pure bliss. 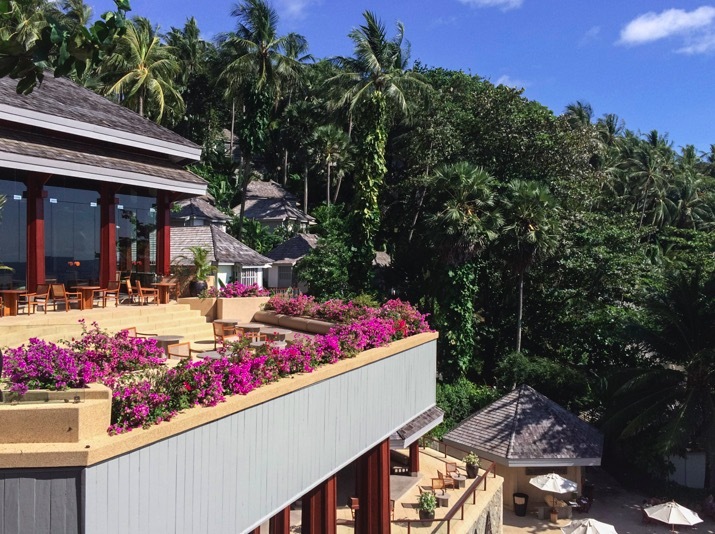 The resort itself sits on a slope, so to reach some of the bungalows (yes, each room is a separate bungalow!) you have to climb quite some steps. The same is true if you want to go down to the beach or the pool, there are lots of steps involved. So that’s not ideal for a stroller, and hence we didn’t bring one. The hotel staff was great that they gave us a bungalow that is also accessible via a flat road, so we could easily get to our room and back. We just carried Lina in a sling or in our arms and that was totally fine. We could have had high chairs in the restaurants, but Lina was too small, so we just put her on a blanket on the sofa and sat next to her – and during the day she had her own lounge chair at the beach in the shade. 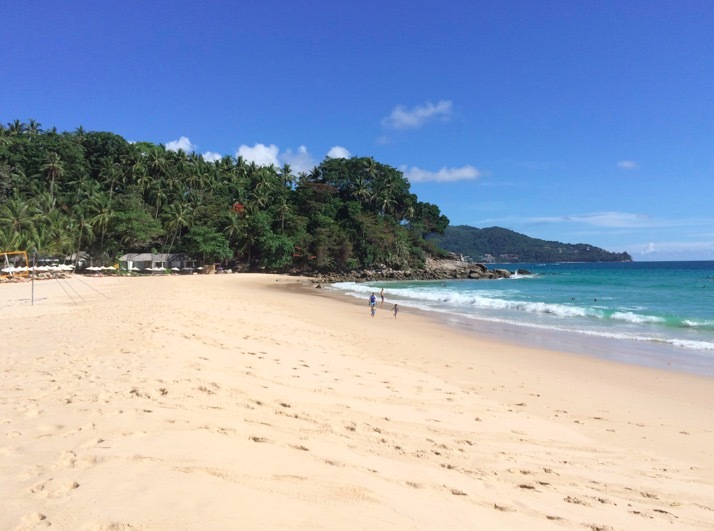 It was the first time that we went into the sea with her – and just one word of caution: the sea is beautiful at The Surin, but can be quite choppy. We had plenty of waves while we were there. That’s great for the water sport fans, but not so great for a small baby. So we kept her outside of the sea most of the time. We could have tried the beautiful black swimming pool (it looks amazing, I’ve never seen a black pool before!) but we were too lazy! Food choices are great – the breakfast has a nice selection of Asian and Western delicacies and everyday there are different items. We tried the Thai food at the pool and that was great too, probably the nicest Pad Thai I had in a long time. For dinner, we went to the beach club and had grilled seafood and veal. The surroundings at the beach club at night are beautiful, you can hear the breaking of the waves, walk alongside the beach, see the stars and just enjoy a romantic night outdoors. Ruth, when Michael was working in New York, his boss had a beautiful house (it was on Long Island) with a tennis court and a black pool! It is quite amazing to swim in a black pool, it is warmer and it feels, at least to me, like I was swimming in oil. You must try it some times. I am very tempted to go back to the Surin again and try it… maybe I can convince my parents to join me for a quick trip to Thailand when they will be visiting at the end of the year.